In the early hours of 6th June 1944, the campaign to liberate Europe began following many months, if not years of planning and preparation. The RAF was heavily committed in support of allied land and sea forces flying combat air patrols, ground attack and reconnaissance missions. After a further year of fighting a hard fought victory was achieved. 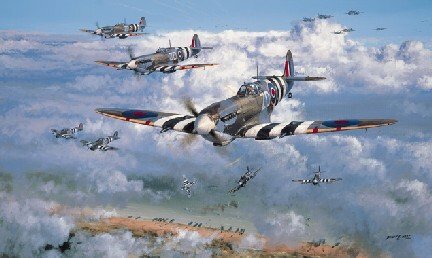 All the prints are signed by two Spitfire and two Typhoon pilots who flew during 揙peration Overlord�. A Certificate of Authenticity and biographical details on each signatory accompanies every print. F/O Tony (Titch) Hallett DFC a member of 198 Rocket Firing Typhoon Squadron operated from bases in Southern England (Manston to Hurn). Operating from Thorney Island on D-Day and then from several landing strips on The Beachhead, France and Belgium between January and November 1944. After Fighter Pilot training in the USA in 1941/42 he returned to the UK for conversion to Hurricanes and was then posted to an Army Co-operation Unit in Northern Ireland where he gained valuable experience flying various types of aircraft, i.e. Defiant, Lysander, Hurricane, Martinet and Twin Engine Oxford. His operational flying from Southern England consisted mainly of attacking the many strongly defended Radar Stations from Ostend to Cherbourg and on two occasions changed from rockets to bombs for attacks on Noball Targets (flying bomb sites). Operations from the landing strips consisted, with close Army Support, taking out Gun Positions, attacking Tanks and destroying anything that moved in enemy territory all against very heavy enemy Flak. He completed in excess of 100 sorties and since 1984 has revisited Normandy on many occasions. He attended the official funerals of two 198 Squadron Pilots whose aircraft wreckage had been discovered as many as 41 and 49 years after the events. Flt. Lt. David Ince DFC was born in Glasgow and was educated at Aysgarth School and Cheltenham College. Failing to meet the eyesight standards for aircrew he became a gunner officer in 1940 and managed to pass a wartime RAF medical board at his third attempt. Seconded for Army Cooperation duties, he trained in Canada at 35 EFTS and 37 SFTS before returning to the UK to fly Hurricanes and Mustangs at 41 OTU. Subsequently converting to Typhoons he flew with 193 and 257 Squadrons, from Normandy until the end of hostilities in Europe, completing almost 150 sorties and being awarded an immediate DFC. He took a leading part in trials, demonstrations and the early operational use of Napalm. Almost shot down on one reconnaissance flight, he later devised and proved a camera installation for low level close up target photography, which was an immediate success. In the closing stages of the war he was leading 193 Squadron on shipping strikes in the Baltic. After attending the first post war course at The Empire Test Pilots School he returned to University to complete an engineering degree. Flying Officer Tom Hannam qualified as a pilot in October 1942 having been trained by the US Army Air Forces in Georgia, Alabama and Florida. Returning to the UK and after Operational Training Unit he joined 222 (Natal) Squadron, which was equipped with Spitfires Mark V抯 in January/February 1943 aged 21. Most operational sorties were on sweeps, high cover for bombers and ships convey patrols. At the end of September he was shot down over Normandy and spent the next three months avoiding capture by the Germans. Eventually arriving in Gibraltar he was flown home on 23 December 1943. After a brief period he rejoined 222 Squadron to take part in the invasion of Europe and went through Northern France, Belgium and Holland. In December 1944, with the war in Europe no more than 5 months from its end, the Squadron converted onto Tempests Mark V抯 and returned to Europe supporting the crossing of the Rhine near Nijmegen and then into Germany. Operational flying covered attacks on airfields, trains, road transport, tanks and rocket sites. When the war in Europe ended he became a flying instructor on Tiger Moths for a short period. Tom returned to civilian life a little older but very much wiser. Flt. Lt. John 慍hips� Carpenter DFC was born on 9 April 1921. He began elementary flying instruction at Redhill and later on Harvards at Turnhill with the RAF in February 1939 and on completion of his training he joined 263 Squadron at Filton in November. On 21 April 1940 the squadron embarked on HMS 慓lorious� for Norway, flying off three days later to land on a frozen lake. By the 26th all the Gladiators were either destroyed or unserviceable, so 263 Squadron re-embarked for the UK. In May another attempt was made. From the 21st until it re-embarked on HMS 慓lorious� on 6 June the squadron gave a good account of itself, covering the evacuation of the Army and flying offensive patrols. The carrier was sunk by enemy action soon after sailing and nearly all 263抯 pilots were lost. Carpenter had not flown on to the carrier and returned to the UK by another ship. He joined 222 Squadron on Spitfires at Hornchurch in late June 1940 in time for the evacuation of Dunkirk. On 31 August he claimed a probable Bf109, on 1 September he destroyed another Bf109, on the 3rd a Bf110 and on the 4th a further Bf109. Soon afterwards he was shot down and wounded and returned to the squadron in October. Carpenter stayed with 222 Sqn. until April 1941, when he was posted to 46 Squadron, just as it prepared to go to the Middle East. The squadron embarked on HMS 慉rgus�, before transferring to the 慉rk Royal�, from which they flew off to Hal Far, Malta on 6 June. 46 Squadron was kept in Malta and re-numbered 126 Squadron. On 30 June Carpenter shot down a Mc200, on 4 September he claimed another, on 8 November a Mc202, on the 12th another Mc202 and on 27 December he shot a Ju88 down into the sea. Carpenter, who had been a Flight Commander since early October, was awarded the DFC (2.1.42) and posted to 92 Squadron in the Western Desert. In May 1942 he covered the invasion of Sicily and Italy and was given command of 72 Squadron at Anzio. After a rest Carpenter was given command of 72 Squadron at Lago, Italy in January 1944. On 11 April he was posted away, received a Bar to the DFC (7.7.44) and returned to the UK. He went to Hawker抯 as a production test pilot. Carpenter was granted a Permanent Commission in September 1945 and he retired on 31 December 1959, as a Flight Lieutenant, retaining the rank of Squadron Leader. Post war he served as CO in Kai Tek, Hong Kong.